Earlier we blogged about new merge tags for conditional content. That means you can send your newsletter with personalized content to each recipient. Like the 90s TV show within a TV show, Tool Time, used to say, we’re giving it "more power." You can now preview what the email will look like for an individual contact. When you are in the Editor, click on Preview/Test Mail (the large blue button on the top left of the Editor). You will see a box labeled Send a Test Email wherein you can input emails to send the test email to. 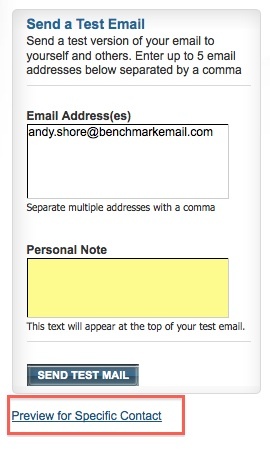 The yellow box below that allows you to leave a personal note to the test mail recipients and right below that box is where you can click to Preview for Specific Contact. A box will appear where you can enter the email address of the contact you would like to see a preview for. This will allow you to see if the conditional content in your email newsletter is working the way it should.